The SportsArt Fitness C521r Recumbent Cycle is a recumbent exercise bike that allows riders to lean back while riding, rather than sitting straight up and down, as with traditional stationary bicycles. This design, which is ideal for users with knee or back problems, plus the model’s solid performance and longevity, make it an extremely popular bike. This bike made it to our top picks for the Best Elliptical Machines of the year. 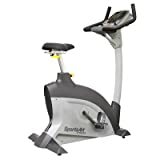 This is a commercial grade cycle that also has many home user fans, due largely to the features that allow anyone–from a novice to a fitness aficionado–to use it with ease. While the SportsArts Fitness C521r has a number of great elements that users love (see below), the bike’s biggest strengths for most riders are likely to be the comfortable entry and seat, both of which make it ideal for orthopedic rehab or users with chronic injuries. Unlike many bikes, the C521r has a step-through entry, so it can be ridden immediately after surgery or by seniors with compromised flexibility. The mesh seat back of the C521r reclines and has easy fore and aft adjustment. It also has a pocket to hold hot or cold lumbar packs–perfect for riders with back issues. The SportsArts Fitness C521r is a self-generating bike and does not use any outside power supply. The display on the large console is both dot matrix and LED and shows pre-set programs, exercise feedback and heart rate via telemetry. A back-up battery saves data for two minutes, in the event the rider stops pedaling. The 24-pound flywheel provides 20 levels of resistance and smooth pedaling. There are four user IDs allowed on the bike, so different workout preferences can be utilized by multiple family members. The pre-set workouts on the C521r offer a good variety for a range of fitness levels. Riders can choose from pre-determined intervals, custom-designed intervals, three hill workouts, a random workout or a quick start mode. Users can also perform manual programing, and there are two “Cardio Advisor” programs: a heart rate zone workout and a heart rate control workout–conducive to weight loss and cardiac rehab regimens. Users who turn in their warranty card to SportsArts Fitness are sent a complimentary heart rate monitor strap. There really are not a lot of cons to the SportsArts Fitness C521r Recumbent Cycle. The bike is heavy (shipping at 179 pounds), but that weight contributes to its considerable sturdiness. While it is easy to assemble and comes with all the tools necessary, the C521r is a large model at 66″ long x 26″ wide x 51″ high. Although the C521r can be used anywhere because of its self-generating power, most users will find it best to assemble it where they want to use it and keep it in one location. The biggest competition to the SportsArts Fitness C521r are remanufactured models of similar bikes from Life Fitness and Star Trac. While these may come in at a lower price point, they do not provide the long-term warranty offered by SportsArts Fitness. The SportsArts Fitness C521r Recumbent Cycle isn’t cheap. But users of this model will likely find they get every penny’s worth out of this bike, and it’s no wonder it’s frequently found in hospital physical therapy departments. The C521r is entertainment bracket compatible and comes with a water bottle holder and book rack. With a maximum user weight of 400 pounds, it will accommodate virtually any rider. SportsArts Fitness offers a lifetime warranty on the frame, ten years on the mechanical parts, five years on the electronics and one year on labor, with a similar commercial warranty. While it’s nice to know the warranty is so comprehensive, users of this bicycle are generally so satisfied with the C521r Recumbent Cycle that they rarely have to use it. This is an excellent piece of equipment for the price, and buyers can expect to get years of use from it without outgrowing it as fitness improves. Fabrication Enterprises SportsArt Fitness C521u Cycle - 40" x 56" x 22"